(CBS) - Surfers and sharks may not naturally be the best of friends. 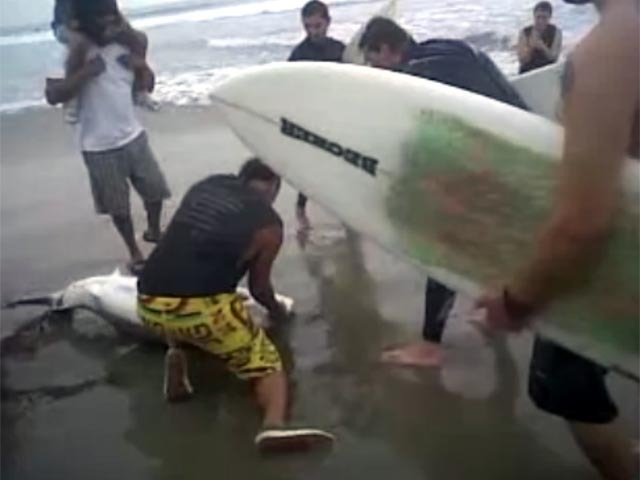 But differences were put aside when surfers on California's Venice Pier reportedly found a great white shark pup washed ashore with a hook in its mouth. These quick-thinking beach-goers removed the hook from its mouth and dragged it back out to see. Check out the incredible rescue video above. As CBS station KCBS reports, the southern California coast is a popular spot for juvenile great white sharks to roam and, well, cut their teeth. It's unclear whether or not the little guy in this video survived, but we have to commend the surfer/heroes who did their best to help.